There’s a science to roofing and we’re at the head of the class. We’ve essentially put our 117 years of “we’ve seen it all” experience into a database, invested in the latest technology, and outfitted our laboratory with state-of-the art equipment and expert scientists. Science is central to each aspect of our business; from the design and manufacturing of our roofing products, to the recommendations we make as roof asset managers, to the way we service, maintain and repair roofs to extend their service lives. Using science to assess a roof’s current condition. 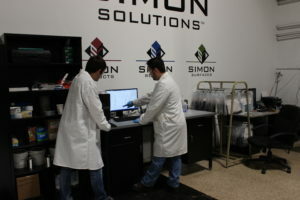 Simon Roofing scientists work every day using both industry standards and self-developed, proprietary methods to test core samples from roofing systems located all over the country in order to determine – in an objective manner – the condition and remaining service life of a roof. Armed with this reliable information we are able to develop a customized plan for each individual roof that’s efficient, budget conscious and in line with a customer’s business objectives. y intervening at the right time … with the smartest solution. Studies show the return-on-investment for roofing maintenance dollars is significantly better if done proactively versus running the roof to failure and then replacing it. Using science to develop the best materials to use on a roof. As a manufacturer of our own exclusive roofing products, we task our scientists to develop the most efficient chemical formulations of materials for the various climate and building type scenarios our customers present us. And between our in-house lab and access to additional testing equipment and STEM brainpower at Youngstown State University, we have the luxury of a wealth of resources at our disposal. Our customers tell us it’s all about stopping leaks, lowering energy costs and extending the life and warranty of a roof, and through an ongoing investment and dedication to science, that’s just what we’re doing for them.